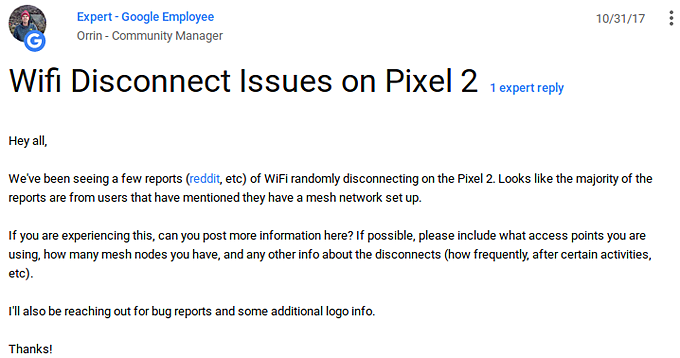 Yet another Google Pixel 2 issue has come to light. It's related to random WiFi disconnects, with most reports mentioning the problem occurs while the device is on a mesh network setup. The problem seems to be affecting both first and second gen Pixels running Oreo. On the network side, those with Netgear's Orbi routers seem to be affected the most. There's even a dedicated forum thread related to this on the official Netgear forum where users say Android 8.x crashes their router. For its part, Google is asking for bug reports as well as some additional information. This solution isn't feasible for all users! most users can't have fixed IP setup !